Unfortunately, due to sales rights restrictions, we cannot offer In William the Conqueror's Footsteps for sale in your country. 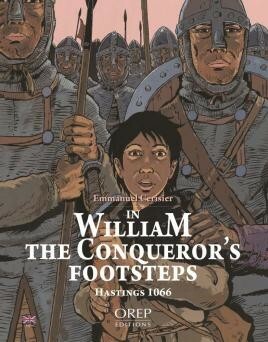 In 1066, William, Duke of Normandy, raised an army to invade England and to seize the throne. Maixent, a young boy from a poor family, became the unexpected companion of a nobleman named Tancrède de Hautmesnil on his way to join the Norman chief on the coast. From there, on the 28th of September and taking advantage of favourable winds, the fleet set off to launch the assault on England. Aboard the many ships, men feared the capricious seas, but, as soon as dawn broke, the enemy coast was already in sight. They would soon be in Hastings for the decisive battle.